Are you middle-aged? Is your once agile mind slower to learn new things? Is the mind that was once a steel trap more like a sieve these days? Which is why I enjoyed this book so very much. 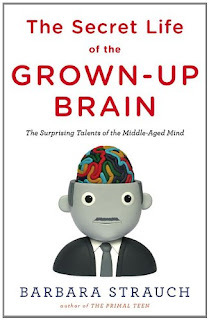 The Secret Life of the Grown Up Brain by Barbara Strauch is one of those books that gives you hope and a sense that even though you might think you're losing your goddamn mind, you're really not. Strauch takes the idea that an aging brain is not valuable, not as smart as a younger brain and tips it on its head. So even though you can't remember where you left your phone, your keys, or your glasses, there are other things for which your aging brain is just right. Go, brain, go.